Positive psychology is the scientific study of optimal human functioning, happiness, well-being and success — the strengths and virtues that enable individuals, communities and organizations to thrive. Traditional psychology’s focus is primarily on a disease model of treating mental illness; positive psychology focuses on a wellness model. What is it that sets apart people who are thriving and flourishing? Put simply, positive psychology in not about fixing what is wrong with you, it’s about building and enhancing what is right. In the late 1990s, Dr. Martin Seligman of the University of Pennsylvania, one of the field's founding fathers, brought positive psychology to the forefront during his time as President of the American Psychology Association. 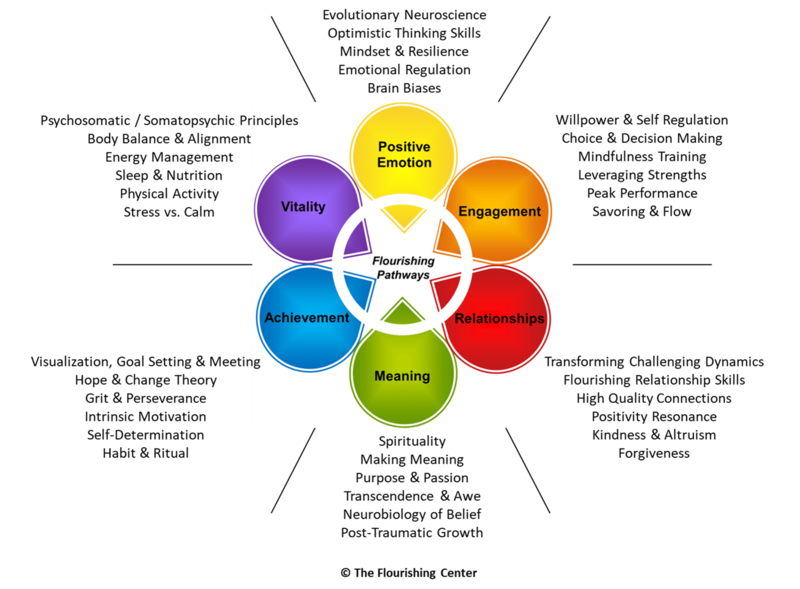 The Flourishing Center, offering the world’s leading positive psychology certification program, updates this model to PERMA-V™, adding in Vitality, as the importance of our physical well-being is paramount in a flourishing life. (made popular in the book “The Secret”). It is not a self-help movement; it is a scientific field of study. a full range of human emotions. optimism, and in turn, our opportunity. It is not a modality for treating psychological disorders or meant to replace psychotherapy. What Can Positive Psychology Do for You?